On Oct. 4, Professor Harleen Singh presented a talk titled “Honorable Deaths and Dishonorable Lives: Women and Partition Narratives in India” to University staff and students in Allbritton. The talk was produced by the English, FGSS (Feminist, Gender, and Sexuality Studies), and History Departments, as well as the Dean’s Fund. According to Singh, the assault of women’s bodies during the 1947 partition became a foundation for Indian nationalist identity. It was cemented in the resulting cultural and artistic narratives, a trope of trauma which continues to be employed to this day. William Pinch of Wesleyan’s History Department opened the talk by introducing Singh, a storied Associate Professor of South Asian Literature and Women’s Studies at Brandeis University. 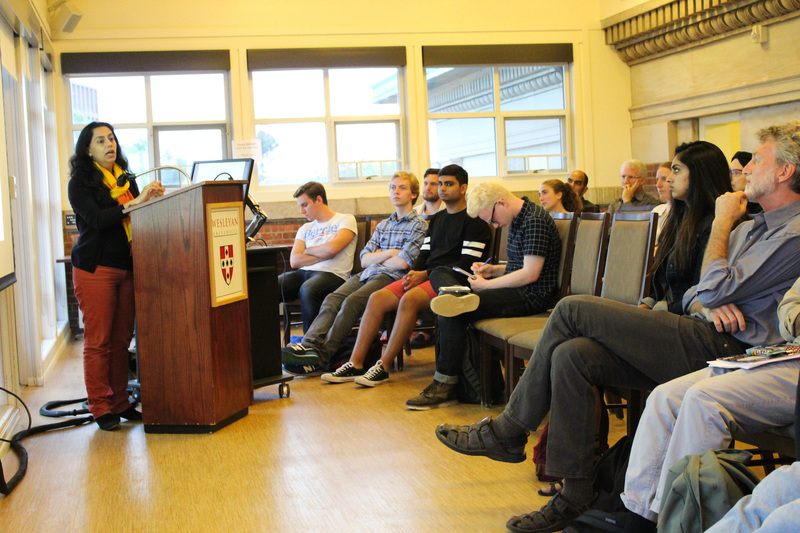 Singh, whose grandparents on both sides were forced to flee their respective home countries of Burma in 1942 and India during the 1947 partition, brought her personal insights into a lecture on displacement and nationalist narratives. “Maps for India, for my grandparents, were not fetishized objects through which they could actualize their adventurous spirits and see the world, but rather the insane truths of violence and displacements that they have continued to live with,” Singh said. The 1947 partition of India into modern-day Pakistan, India, and Bangladesh caused the displacement of an estimated 14 million, which marks the largest movement of people in recorded history. Though massive in scale, Singh discussed why the dominating narrative that emerged out of this unprecedented exodus of men, women, and children was of the estimated 50,000 abductions of women. As a result of these accepted conceptions of womanhood, when crossing the border during partition, many families felt they must kill their female members to protect them and their honor from kidnappers. Stories of suicide were also widespread. “These killings constitute a narrative of the nation, a narrative of honor for the nation,” Singh said. Women who were forced to live with Pakistani or Indian abductors were often considered dishonorable to their respective dawning nations and families across the border. The governments of Pakistan and India attempted a response effort to recover the kidnapped women. According to Singh, however, this institution greatly underestimated and failed to take into account the multiplicity of faiths that were represented in regions affected by partition, occasionally mistaking consented couplings with kidnappings. The notion of dishonor also greatly complicated the recovery process. “Though close to 28,000 women were repatriated between India and Pakistan, most of them languished in refugee camps because their families would no longer accept them in their dishonored state,” Singh said. In the subsequent years, these accounts were popularized into novels, short stories, films, and television shows, appearing in various languages like Hindi, Urdu, Punjabi, and Bengali. Singh stressed the importance of analyzing these artistic representations of reality. The Indian narratives represented through art often draw upon character tropes such as an abducted or raped female character, Muslim intransigents, and British colonizers as manipulative puppet masters. Across various art forms, from the moving image to the written word, these partition narratives often center on heterosexual romances that are threatened by the boundaries of nationalism. Singh brought up “Gadar: Ek Prem Katha,” a 2001 three-hour blockbuster directed by Anil Sharma, which tells a forbidden love story between a Sikh truck driver and a Muslim girl, set in Indian partition. Singh found the movie difficult to watch because of its representation of women and its nationalist overtones. The truck driver (played by actor Sunny Deol) fights an uncounted number of Pakistani soldiers to rescue his love and damsel in distress (played by actress Ameesha Patel). Singh noted that there were multiple instances of anti-Pakistan slurs shouted throughout the viewing, which echoes her weariness of these jingoist works. “Voices of feminist scholars, women’s voices, remained absent from these narratives,” Singh said. Despite the overarching presence of problematizing films like “Gadar,” some narratives that work against this gendered nationalist grain have begun to gain traction over the years. Singh discussed works that date back as early as Amrita Pritam’s 1950 novel “Pinjur.” The main character, Puro, is abducted and raped by a Muslim man. Her family rejects her after discovering this information and she reluctantly returns to her abductor and son in Pakistan. At the end of the novel, when approached by her family and asked to return home, Puro refuses, making the choice to continue her new life in Pakistan. Puro’s ability to decide to stay in Pakistan is a rebellion against the lack of agency proliferated in popular partition narratives. Singh is currently working to transcribe this novel into English. Refugees in memory are romanticized by authors and directors, yet Singh emphasized that these post-trauma page-turners fail to do justice to the actual horrors experienced. Many of the members of the Wesleyan community that attended the lecture, including Jaime Marvin ’19, found it both insightful and compelling. “I learned a lot, and the perspective around how women in this context, how their bodies are politicized by their families, was very interesting and chilling to listen to,” she said. Livia Wallick ’20, another attendee, echoed Marvin’s sentiment. Faizan Razak ’20 also attended the lecture, deciding to come after a discussion with Singh earlier that day. Ultimately, Singh questioned the ethical foundations of the accounts that she analyzed. Voices from the Pakistani side of this divide still go unheard. In the end, Singh applauds this growing body of literature, exemplified by the works of Pritam, which detail the violence and horrors that occurred during partition. However, Singh notes that these artistic representations are not enough for any concrete form of healing to occur.